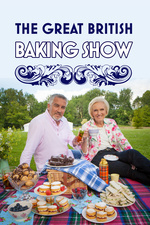 My favorite part of this episode might be Mary telling Paul to "say something nice" while judging the plaited loaves. Paul often gets criticized for being mean, but the flip side of that is when he says "Yeah, I really liked that" you know that the person absolutely killed it. I think he’s very blunt, often harsh, but generally it doesn’t seem like he intends to be cruel. And as you say when he says anything positive you know he’s not trying to just be pleasant.